Identification of a lamin A–progerin–binding inhibitor. (A) Interaction of progerin and LMNA A/C but not lamin B. GST pull-down assay using lysates from HEK293 cells transfected with lamins A, B, C and progerin after incubation with the C-terminal 100-aa sequence of lamin A (564-664 aa; GST-LMNA) or 50-aa sequence of progerin (564-614 aa; GST-progerin). (B) Strong interaction between lamin A and progerin. Lamin A–progerin interaction was detected after a 1-hour incubation. However, progerin did not show evidence of self-association. Rx, treatment. (C) Direct interaction between lamin A and progerin. In vitro–binding assay using His-tagged N-terminal (1-300 aa; LMNA-N) and the middle region (LMNA-M) of lamin A after incubation with GST-LMNA or GST-progerin. Associated proteins were analyzed by Western blotting. N, LMNA-N; M, LMNA-M. (D) Scheme of the interaction between lamin A and progerin. (E) ELISA results. His-tagged LMNA-M was fixed in a 96-well plate and incubated with GST-LMNA or GST-progerin. Photograph of the 96-well plate (inset) and ELISA value. (F and G) Progerin did not induce nuclear deformation in neuron or embryonic neuron cells. 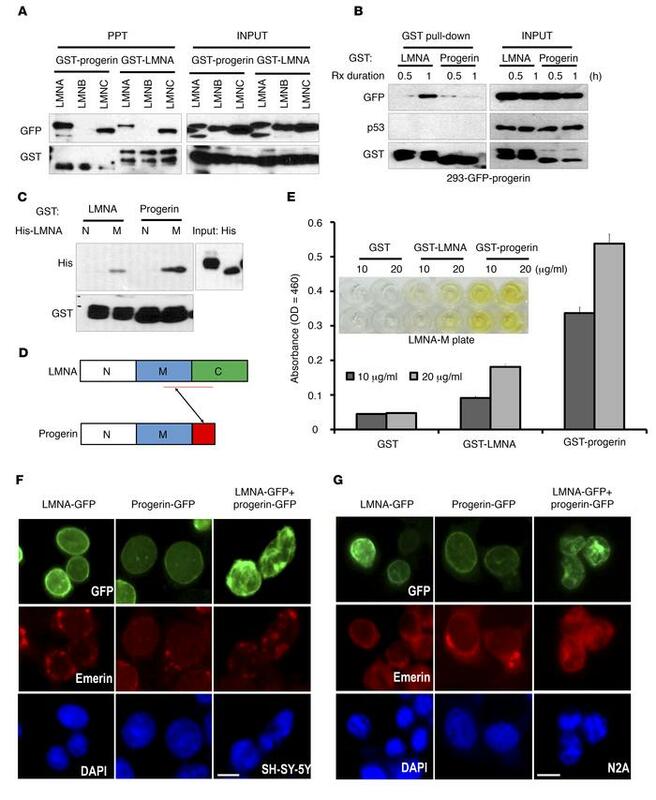 Transfection of GFP-progerin or lamin A alone into the neuroblastoma cell line SH-SY-5Y (F) and the mouse neuroembryonic cell line N2A did not induce nuclear deformation. However, cotransfection could induce it. Cells were transfected with the indicated vectors for 24 hours. For visualization of the nuclear membrane, cells were stained with emerin (red) and DAPI for DNA (blue). Scale bar: 10 μm.